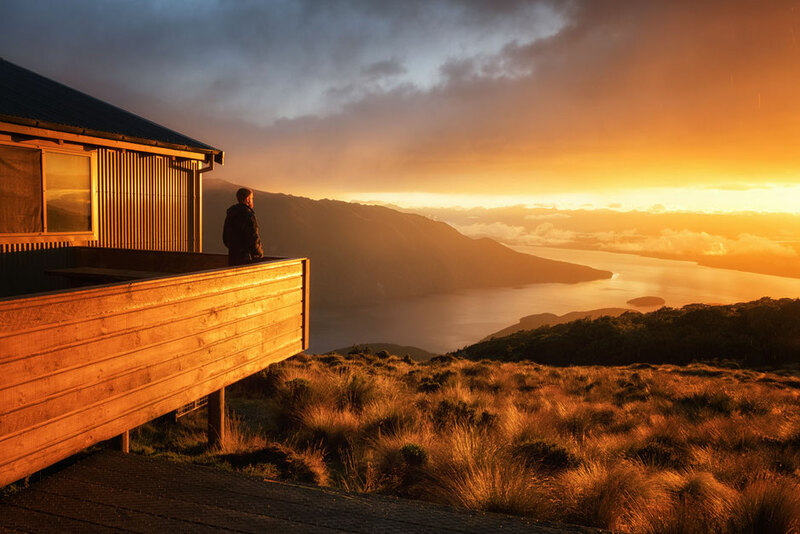 If you are looking to add an epic experience to your New Zealand bucket list, then staying in a mountain hut should be it! You might not get the comforts of a private ensuite room in a hotel with an in-house restaurant but you will create stories to tell and forge memories you won’t forget in a hurry. 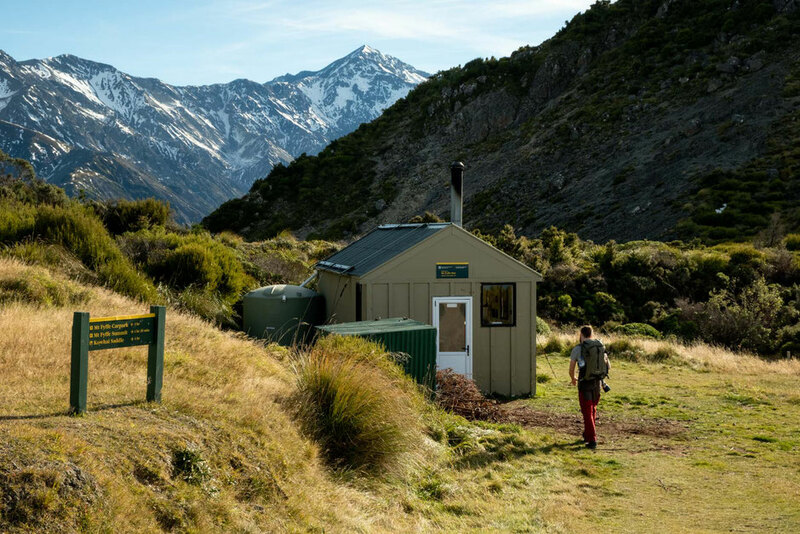 Most of the one thousand huts in New Zealand are owned and operated by the Department of Conservation but the New Zealand Alpine Club (NZAC) does own a few too. They range in difficulty to reach, price, amenities and booking regulations, but I will get to that in a second. You can sometimes expect a little shack, or a full blown 54 bed backcountry 'villas' with flushing toilets (including toilet paper), kitchens, mattresses and evening entertainment. Some are serviced and have full time wardens, others are there to only provide a basic shelter after a long day of hiking, but they all have one thing in common - a million dollar view! The Aspiring Hut stands proudly in the heart of the Matukituki valley and it gets its name from the National Park it's located in. From the Raspberry Creek Car Park it’s an easy, flat, 9km hike to the Aspiring Hut. The hut is owned by NZAC (New Zealand Alpine Club) but operated by the DOC (Department of Conservation). 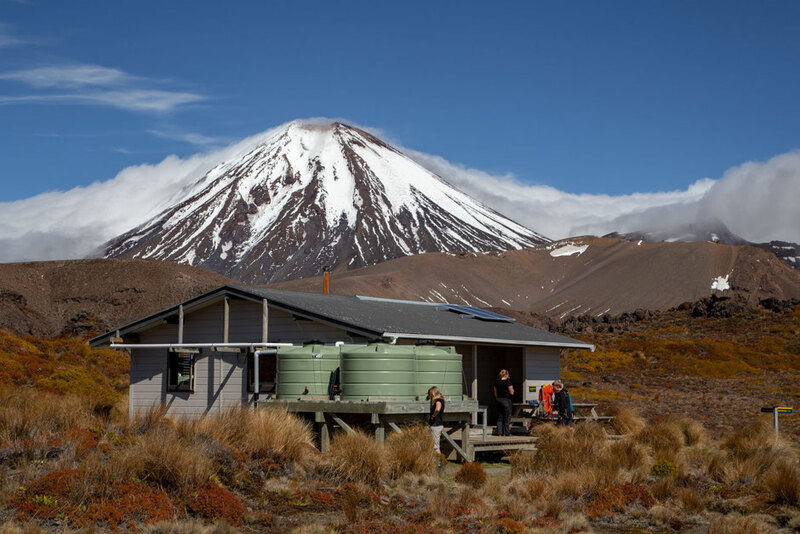 It’s one of the fancier huts which boasts flushing toilets, a huge kitchen with gas hobs, big benches and tables, log burners, two separate bunk rooms and a great location to explore the Matukituki Valley. It’s through the Aspiring Hut that you can reach Liverpool Hut and French Ridge Hut. One of the most popular trails from the Aspiring Hut is the route up the Pylon and further to the Cascade Saddle. A great hike in Wanaka if you want the best glacier view I've ever had in New Zealand. 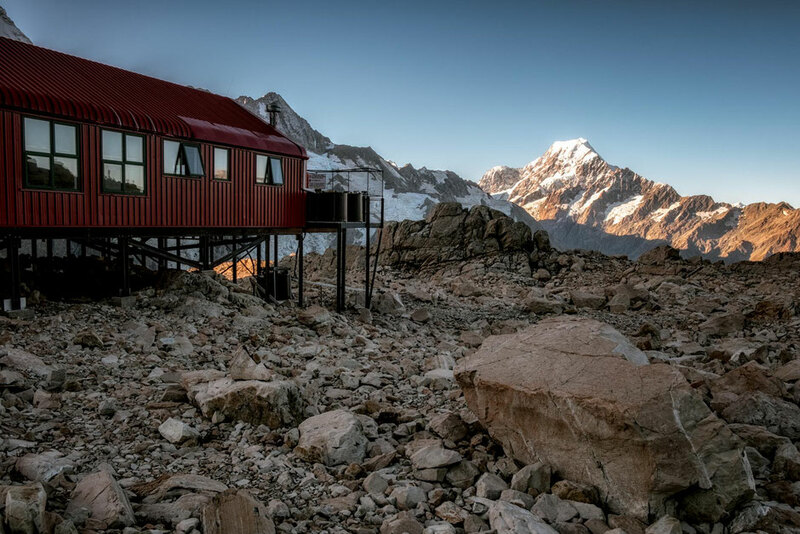 A small alpine hut that offers views over Mount Aspiring National Park. The route up to Brewster Hut can be treacherous in bad weather. It immediately starts with a crossing of the Haast River which can be anything from a trickle to a chest deep, fast flowing river. Do not attempt to cross, if it’s not safe to do so and check at the DOC office in Wanaka before heading out. You can learn how to safely cross a river here. Once you’ve crossed the river, the route climbs steeply through the forest where you’ll have to use tree roots to pull yourself up in several sections. Once above the tree line the path undulates along a ridgeline with a waterfall laden valley on each side. On a clear day you get views of the Brewster Glacier. Once you arrive at the Brewster Hut, you’ll notice that the long drop toilet is in an incredibly precarious position overlooking the valley. A true loo with a view. The hut has a single bunk room, and a basic kitchen, but it remains unserviced meaning you will have to carry your cooking equipment. There is also no warden. Bookings: Available between Dec 1st and April 8th but not mandatory. Otherwise first come, first served. 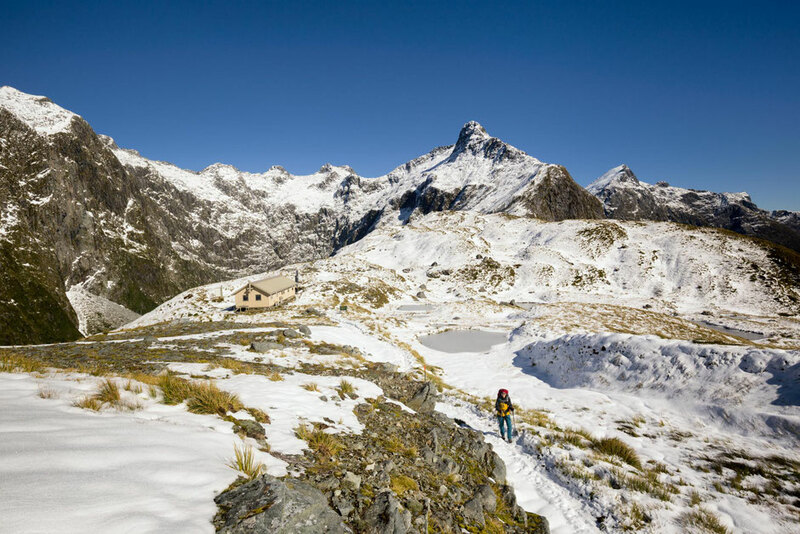 Mueller Hut is one of the most popular huts in New Zealand. It’s unparalleled views of Mount Cook National Park draw many international and domestic visitors. Bookings are mandatory and necessary during the summer season. The route starts from the White Horse Hill Campground and climbs quickly on seemingly never ending staircases until you reach the Sealy Tarns. From there you’ll start a steep hike and soon reach a boulder field. Once you reach the saddle the hike flattens out until you reach the hut. Sounds easy, but it's not! The views from the hut are great, but a quick climb up Mount Olivier, just behind the hut, offers even better vistas. Not only north to Mount Cook but also south to Mount Anne, with glaciers perched onto the mountain walls all around! If you are after more information about this particular hut go to my Hiker's Guide to the Mueller hut hike. 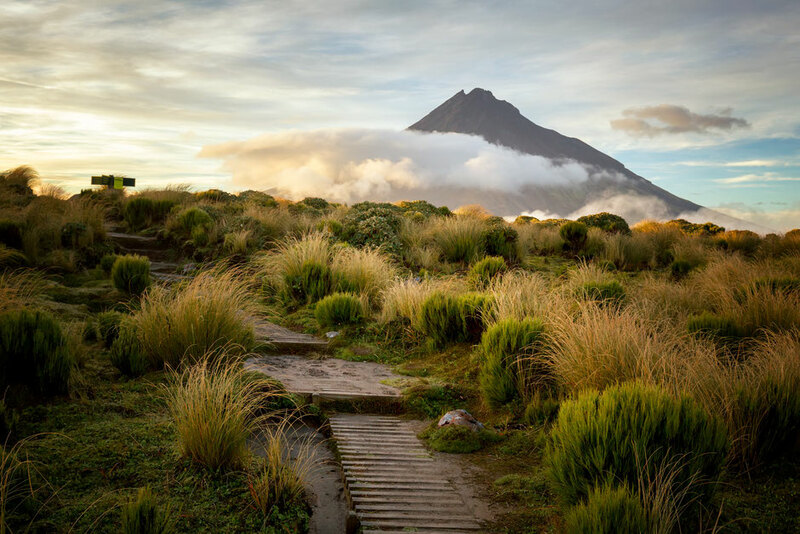 In Taranaki National Park, the word Pouakai comes up a lot. One of the most popular photography spots on the North Island is the Pouakai tarns, on the Pouakai Crossing next to the Pouakai Hut. Pouakai means the “source of food” in Maori. 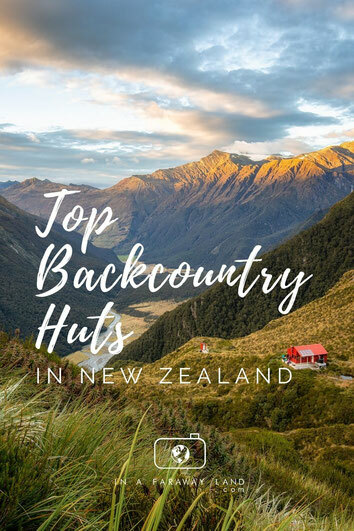 And working out which hut you are going to stay at on your New Zealand North Island road trip is certainly food for thought. The hut is two hours away from the Mangorei trailhead. The route climbs gradually through intertwining forest branches comparable to the Fangorn Forest featured in the Lord Of The Rings movies. The Pouakai Tarns are 15 minutes away from the hut. The first hut on this list that is on one of New Zealand’s 9 (soon to be 10) Great Walks. The Luxmore hut is the first hut you reach if you’re going to do the Kepler Track in Fiordland National Park. 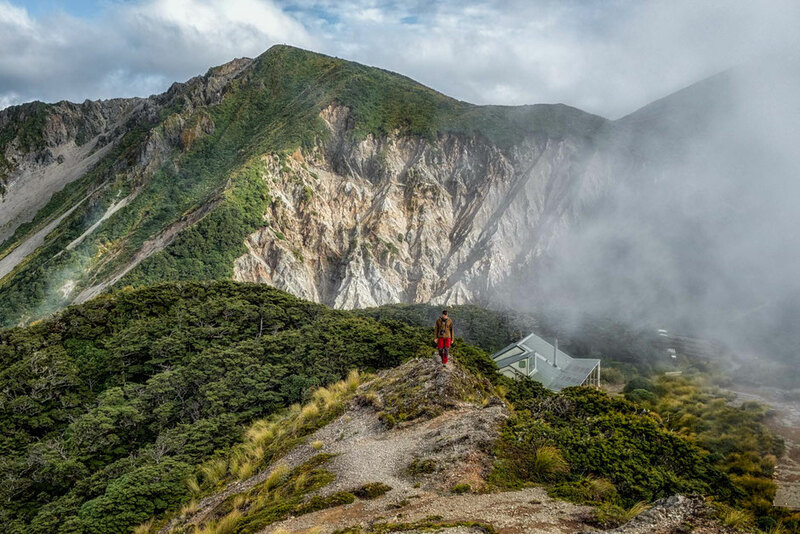 You do not have to do the entire Kepler Track to stay in the hut. It is possible to do it as a one-way in, one-way out hike. To get to the hut it’s a flat walk around Lake Te Anau to Brod Bay but there is a way to shorten it. You can get a shuttle boat to Brod Bay from the ferry terminal in Te Anau and start there, cutting the distance in half. From there it’s a steady uphill hike through the forest and sometimes underneath large cliffs. Once you are out of the trees, the hut isn’t far away over a few undulating meadows. The hut has everything you need for an enjoyable stay. Flushing toilets, hot water, a kitchen with gas and views over Lake Te Anau. In the season there is also a warden present at all times. Bookings need to be made a long time in advance and are mandatory. 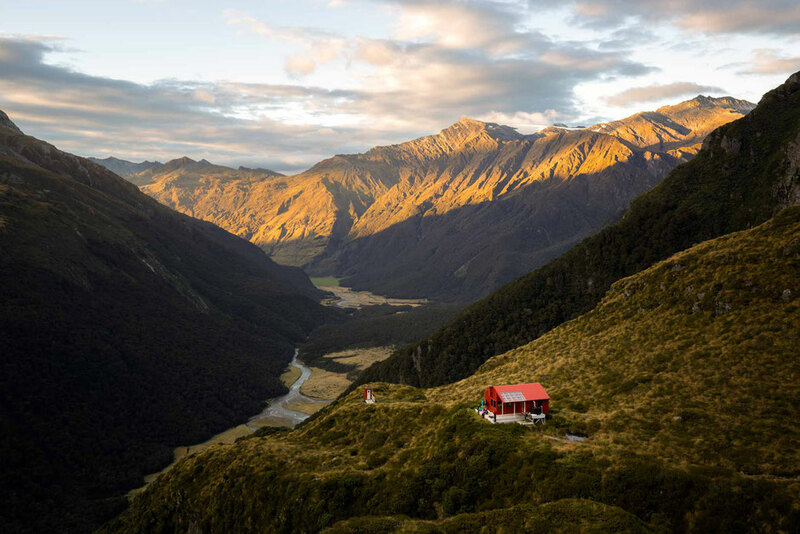 Located in the West Matukituki Valley, Liverpool Hut sits high above the valley floor and stares prominently south, back toward the low lying Aspiring Hut. The route to get here is mostly flat along the valley floor then culminates in a severely angled scramble involving several sections of clambering around large tree roots. The hut itself is quite basic, just 2 communal beds which hold 5 people each, a table, a food preparation area and a magically placed outhouse. 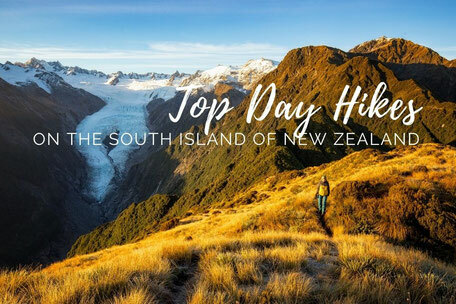 A premier hike in Wanaka for sure. On the other side of the valley, if you squint your eyes, you can spot the French Ridge Hut too! Another scenic hut in the area and worth your time if you have an extra day. I haven't stayed in it yet, but I certainly plan on going back there one day. The Oturere Hut is one of the huts on the Tongariro Northern Circuit. Thankfully it hasn’t been subject to the price increase that some of the other huts on the Greats Walks have but I feel it is coming soon. The hut is located east of Mount Ngauruhue. It is only a few kilometres away from the Emerald Lakes and the Blue lake - the highlights of the Tongariro Crossing, one of the most scenic day hikes on the North Island. The hut has everything you need to ensure a comfortable stay including hobs, gas, mattresses and heating. Although it is not possible to stay overnight in the MacKinnon Shelter, its location makes it definitely contender for the best backcountry hut in New Zealand. Inside you’ll find gas hobs with gas provided, access to water and a bench. Outside you’ll find the most sought after wilderness in New Zealand. 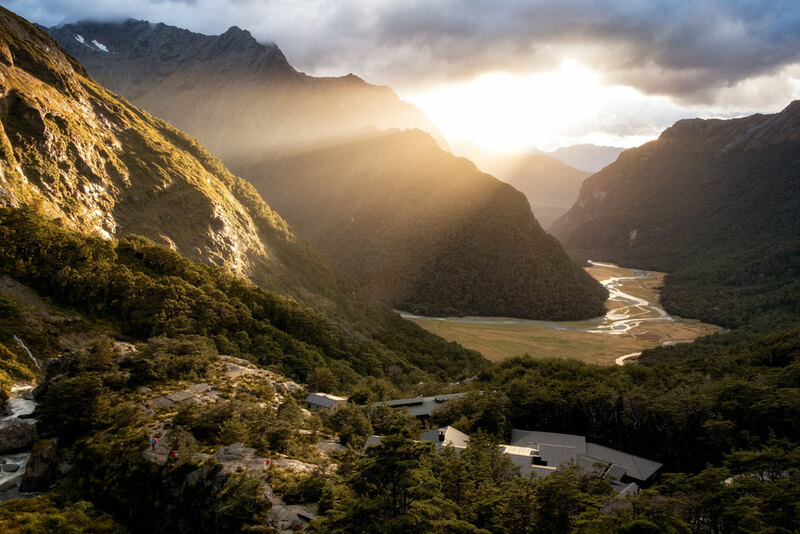 The MacKinnon Shelter lies close to the highest point of Milford Track, a track that has become synonymous with competitive reservations and high prices. You kind of pay what you get for though, providing the weather plays along, just like it did for me. This is currently the 3rd MacKinnon Shelter to be built as the others kept getting blown away! Half of it is also privately owned and operated by a tour company. Popular amongst school groups, the informative Sunrise Track climaxes at the Sunrise Hut. 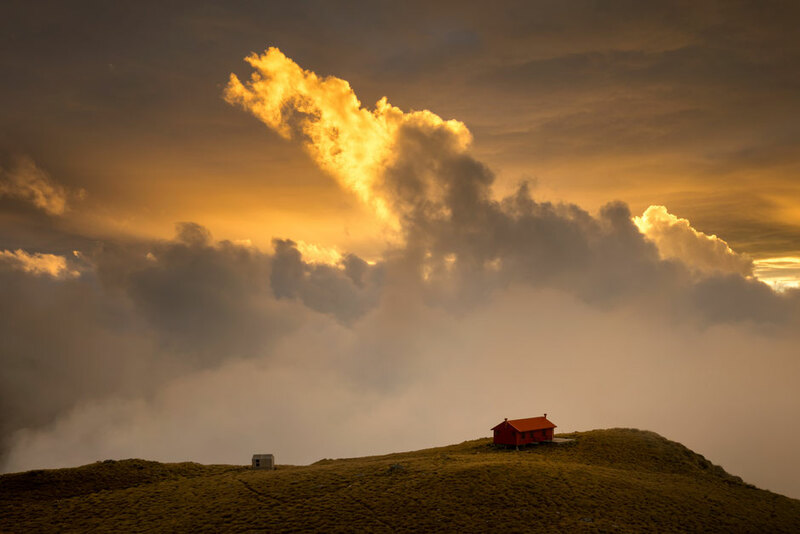 The hut lies just below a scenic ridgeline and as the name suggests faces east toward the sunrise. From the hut there’s several hiking possibilities including the Armstrong Saddle pictured above. The hut has a nice log burner, a big kitchen, potable water, benches, tables and two outhouses (long drop style). 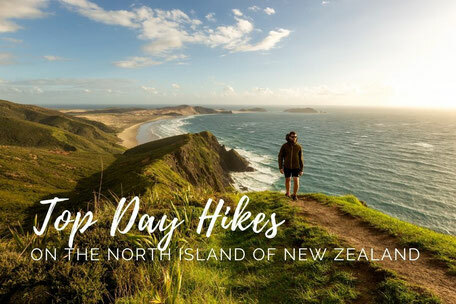 If you'd like to know more about the hike go to my article about the best day hikes around the North Island of New Zealand. 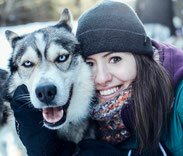 Another Great Walk that has seen a recent price increase for foreign hikers. 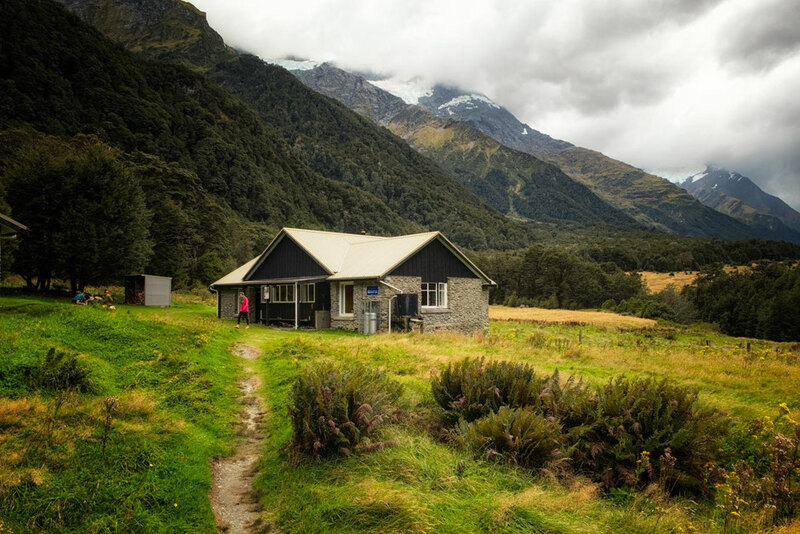 The Routeburn Falls hut is the second hut along the popular multiday Routeburn Trail, starting at the northern part of the trail in Mount Aspiring National Park. It boasts flushing toilets, a huge kitchen with hot water and solar lighting, hobs, gas and ‘comfy’ mattresses and the best warden I have ever met in any of the huts! Its location is on the edge of the tree line situated between thick forest and a wide glacially carved alpine valley, the best of both worlds. As its name suggests it’s situated right next to Routeburn Falls. It’s also the closest hut to the Harris Saddle and Conical Hill. Unfortunately, we’ve reached the end of my list of great huts in New Zealand but not before I’ve told you about the Mount Fyffe Hut. The hut, and the nearby summit of Mount Fyffe, offers splendid views east to the Pacific Ocean and west to the snow-capped Seaward Kaikoura Ranges. It’s a small quaint hut that epitomises the majority of back country huts all over New Zealand. Basic but beautiful. It only has a small bunk room but does have a log burner for those cold mountain nights. The bunk room even has mattresses! Luxury or what? At 5 bucks per person what else can you expect, right? Some huts require reservations whilst others operate on first come first serve basis. Don't show up without a reservation as you may have to turn around or pay an elevated fee. If the hut is first come first serve, it doesn't mean it is free. You will have to pre purchase a hut pass (at any DOC visitor centre) and carry the ticket with you to the hut. Backcountry huts can differ a lot in amenities. Make sure you inform yourself what is available and what's not (for example gas stoves, heating, wood etc). This will influence what you have to bring along and what you can leave behind. Don't leave you trash behind. This is particularly important. I have seen people do it on more than one occasion. I can never understand it. Clean up after yourself. Every hut has basic cleaning utensils provided such as broomstick. Leave the hut as you found it (and if you found it dirty than be a better person and clean it up). It won't hurt your pride, it will actually make you feel better! Come prepared with the right equipment and adequately to weather conditions. Tell someone about your intentions and when do you plan on coming back. Have fun and make new friends, but also be respectful of other people and share the space. As you can see the huts in New Zealand vary greatly in terms of amenities and price. If you aren’t lucky enough to, or can’t afford to secure spots on the Great Walks then there’s plenty of alternatives. There are annual backcountry hut passes, but they don’t include many of the huts above-mentioned and are not worth looking into if you’re only a temporary visitor. All huts that can be booked ahead of time should be to avoid disappointment. For reservations head to the Departments of Conservation Online Booking Portal. Are you looking for more inspiration for planning your trip? Check out my New Zealand Travel Guide! Have you got any questions or would you like to tell me about another awesome backcountry hut in New Zealand? Share it in the comments below!